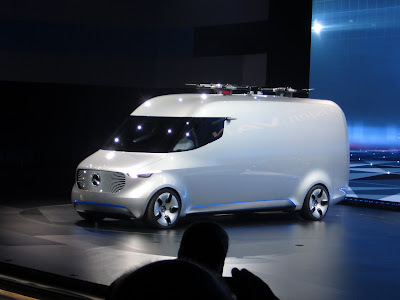 Mercedes Benz Van introduces the futuristic vans that are already using the autonomous technology. Amazingly, the car called 'Mercedes Benz Vision Van' is also equipped with two drones to take the goods into the vehicle. Mercedes Benz was developing the car together with a drone startup company Matternet. Each drone capable of lifting objects weighing of 2.2 kilograms with a cruising range of approximately 20 kilometers for a single battery charge. 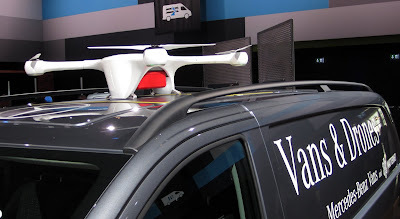 The drone connected with the van uses cloud base to pick up or deliver goods to the car. Robot in the car will work take in accordance with the order of submission and then brought up to be taken by the drone. "Through the Vision Van, Mercedes-Benz Vans presents the idea of ​​the van of future generations should be. The automation technology relate to each other, ranging from loading, delivery process, to send to the recipient. It will simplify the business process delivery and reduce delivery time to the consumer," said Head of Mercedes-Benz Van, Volker Mornhinweg. Although the use of drones is not new anymore, but if it is integrated with the moving car then this can make the job more practical. They include initiatives in digitisation, automation and robotics, as well as integrated parcel delivery systems using drones and sidewalk robots. The use of Vision Van also reduce the human work. The workers only stayed deliver the goods to the closer distances consumers. They also no longer need to search for items to be shipped, but it is set by the system automatically. The drone can recharge the batteries automatically in the car, so it requires no human intervention again. No matter where the van away, the drones will be able to track it down and landed on the car automatically, no need to use the remote control again. The electric-powered cars are suitable for use in urban environments. The power that produces is equivalent of 100 hp with a cruising range of 268 kilometers on a single charge. The interior is very futuristic. There is no steering wheel, the driver simply activates features of the vehicle using a joystick. Design of instrument panels also do not like the current car, but presented through a monitor that is integrated with the dashboard.